If you're looking for a new park to explore, jump in the car and head to Broadwater Parklands at Southport. We met up with friends from overseas, staying on the Gold Coast, at this impressive park recently. 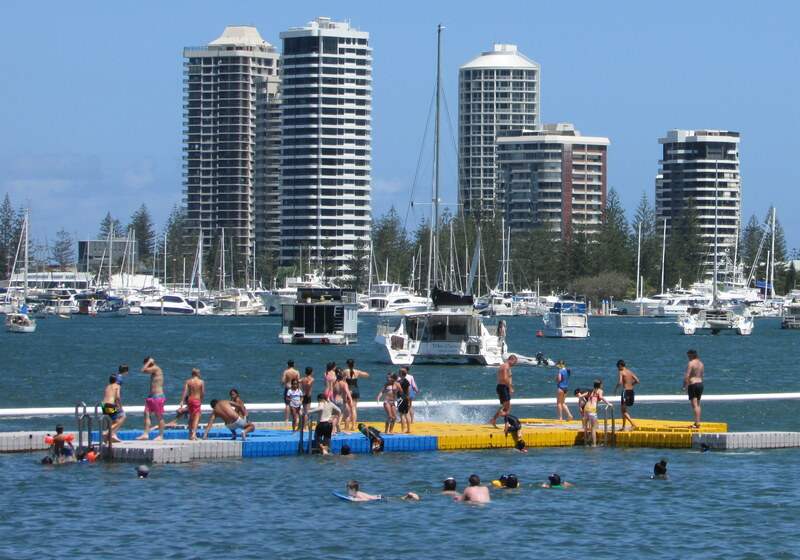 Broadwater Parklands stretches along the Southport foreshore for three kilometres, with something for everyone. 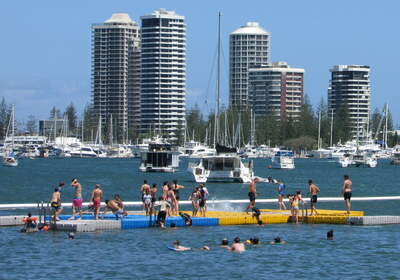 Have a picnic, play cricket, go swimming, fish off the pier, or jump on a giant pillow. We managed to do it all, except one – fishing. The main entrance is located at the northern end of the park, at Nind Street and Marine Parade. This is where you'll find the Southport Aquatic Centre and Fishermans Lawn, an off-leash dog park with beach access. We spent most of our day in the central region of the park. We set up our picnic in the shade of a permanent umbrella on the Great Lawn. While the dads had a game of cricket with the kids, we mums caught up on all the gossip. Next it was play time at Washington Waters Playground. There is plenty to keep kids amused here: swings, slides, flying fox, monorail peddle ride, and BMX bike circuit. The most popular piece of play equipment though is the giant jumping pillow. Then it was time for a dip. There's a small beach located opposite the playground with a safe swimming enclosure and pontoon, patrolled by council lifeguards. After some nibbles and another game of cricket, it was time to cool off again. This time we headed to the Rockpools, a water play area designed to simulate coastal tides with the water filling up and emptying. This is a great spot for the littlies with its rockpools, water fountains, and waterfall. It is also patrolled by lifeguards. We even managed to squeeze in a walk to the Hill, at the southern end of the park. The Hill is the highest point in the parklands and home to Maddie and Bear, oversize sculptures created by Gold Coast artist and award-winning Hollywood animator John Cox. There are plenty of picnic tables and barbecues available. Spread out your blanket on one of the great green lawns or have a private picnic in one of the cute, bathing boxes. If you've forgotten to pack a picnic, the Cafe Rockpool is conveniently located in the parklands. Toilets and showers are located throughout the park. Park up to two hours for free; otherwise ticketed parking is available at $1.50 per hour. The parklands are open daily during the summer from 7am to 7pm. From April to November, the park hours are 9am to 5pm. The Rockpools are closed every Tuesday morning for maintenance. Agreed. This place is awesome and accommodates kids in a range of age groups, so a good one to take the whole family to.